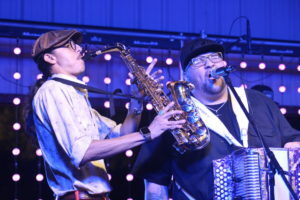 The Sound abounds: Max Baca & Los Tex Maniacs are shown passionately performing, featuring Esteban “Steve” Jordan on the saxophone, son of the legendary accordionist Esteban Jordan. LOS FRESNOS — Despite the threat of rain which lingered all weekend long, Conjunto aficionados from far and wide flocked to the 26th Annual Narciso Martinez Cultural Arts Center (NMCAC) Conjunto Festival this past weekend held here for the first time in the festival’s illustrious history. Fans celebrated a historic and culturally rich event with authentic Tex-Mex food, sweet drinks, vendors; and, of course, some of the tightest and most solid music the Conjunto genre has to offer. Hosting a 17-band lineup, the Narciso Martinez Cultural Arts Center held its festival at Memorial Park after experiences issues with the City of San Benito that caused organizers to cancel last year’s festival. “Harlingen reached out, Weslaco reached out, Brownsville reached out, and then Los Fresnos reached out to us and we said, well, let’s go to Los Fresnos. We had discussions with the mayor, with the commission, and they said okay,” said festival organizer and founder Rogelio T. Nuñez. Subscribe here to continue reading and more, or grab a copy at one of our various newspaper racks – Thank you!